Today the dinosaurs remain, but the smart animals are killed. 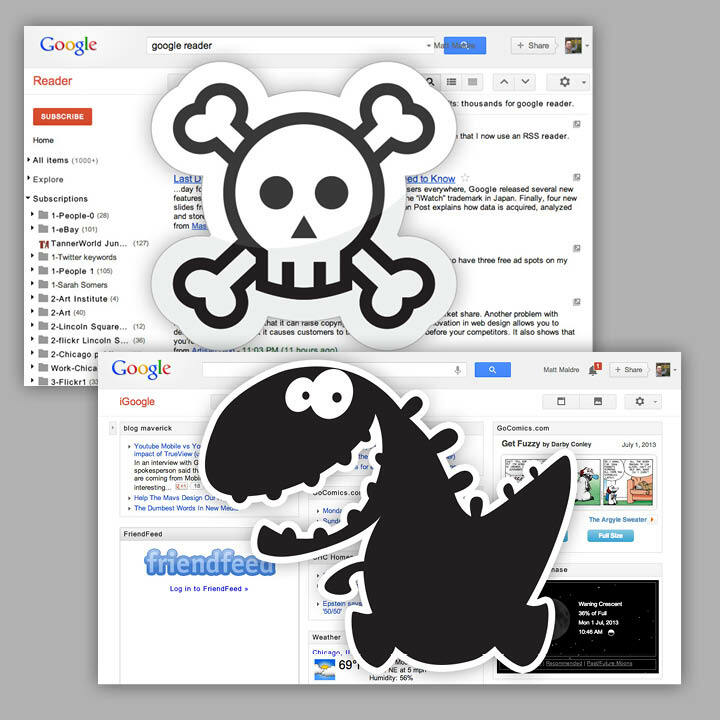 Google kills off the very smart product, Google Reader today, but the dinosaur iGoogle remains alive. Who knew ancient web portals were so vital to Google? Many years have passed since I last visited my iGoogle web portal. My iGoogle even has a Friend Feed widget! Looking at iGoogle with fresh 2013 eyes, there is something to behold about its visual layout with multiple columns. With Facebook and Google Plus both recently going to a multiple column layout, they start making iGoogle look like a pioneer. Especially since iGoogle lets you customize the location of specific sections on the page. iGoogle could actually be useful if it had a “mark as read” feature. That, coupled with the customizable visual layout of iGoogle, would make it into an interesting news source. Google Reader (and now Feedly) are wonderful news sources, but are completely linear in layout. Only one section at a time can be viewed. With iGoogle, you can see multiple sections. There’s something interesing about how iGoogle is more of a visual layout–dare I say almost like a print newspaper. Oh, I just looked at my iGoogle again, and there was a message, “iGoogle will not be available after November 1, 2013.” Looks like the dinosaurs will become extinct this winter!